What Is An Effective Dose of Omega-3 Fatty Acids? Home > Resources > Dr. Sears' Blog > What Is An Effective Dose of Omega-3 Fatty Acids? The November 10, 2018 issue of the New England Journal of Medicine contained two articles on the use of omega-3 fatty acids to treat cardiovascular conditions (1,2). One study (the VITAL trial) used essentially a low dose of omega-3 fatty acids (0.84 grams of omega-3 fatty acids) and found no cardiovascular benefits (1). The other study (the REDUCE-IT trial) used a much higher dose of omega-3 fatty acids (3.8 grams of omega-3 fatty acids) and found significant cardiovascular benefits (2). Both studies used the same endpoint for determining cardiovascular benefits. The low-dose study found no benefits, while the high-dose study found highly significant benefits. This is probably because the omega-3 fatty acid dosage used in the REDUCE-IT trial was 4.6 times greater than that used in VITAL. However, this is far from breaking news. These findings from REDUCE-IT simply confirmed the 2007 JELIS Trial conducted with much larger group of patients (18,000) who were also all taking statins (3). Are There Any Differences Between EPA and DHA? Both studies demonstrated some basic misunderstandings on the mechanism of omega-3 fatty acids and its impact on cardiovascular disease. Both the products used in the studies are only approved to lower very high levels of triglycerides (greater than 500 mg/dL) and not approved for treating heart disease. In addition, one product contained a combination of EPA and DHA (Lovaza) and the other product only contained EPA (Vascepa). Since the REDUCE-IT trial that used the EPA-only product worked, this might imply that DHA is dangerous. This is a story that starts with a statement that EPA lowers LDL cholesterol and DHA raises LDL cholesterol levels and therefore only EPA containing products are useful. That’s a marketing statement that is only partially true. A meta-analysis showed that EPA lowers LDL cholesterol levels by 0.7% and DHA raises LDL cholesterol levels by 2.6% (4). If you have a high LDL cholesterol level of 130 mg/dL, this means using EPA-rich omega-3 supplements will lower your LDL cholesterol by 1 mg/dL and using DHA-rich omega-3 fatty acid supplements will raise your LDL cholesterol by 3.5 mg/dL (4). These changes are clinically meaningless. 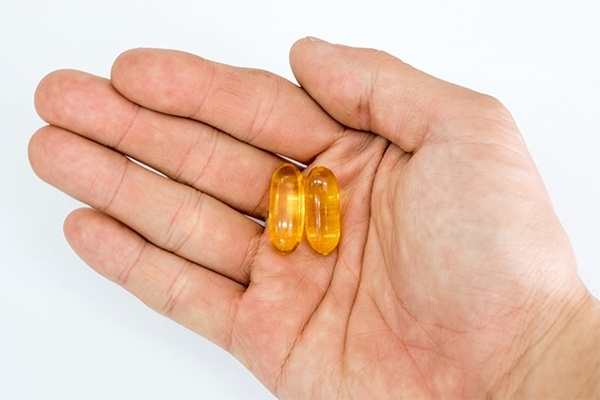 Furthermore, the same meta-analysis study indicated that DHA-rich omega-3 fatty acid supplements are better than EPA-rich omega-3 fatty supplements in reducing triglycerides and increasing HDL cholesterol. These differential lipid effects between EPA-rich or DHA-rich omega-3 fatty acid products essentially balance themselves and suggest that there are no differences between EPA and DHA in lowering total lipid levels. Both are beneficial. Therefore, it is not the absence of DHA that is important, but the dose used. Lowering lipid levels, however, is not the reason that high-dose omega-3 fatty acids have the benefits in reducing cardiovascular events. It is well established that heart disease is an inflammatory disease (5,6). Much of that inflammation is mediated by pro-inflammatory proteins called cytokines. A recent Harvard study indicated that reducing one of these inflammatory cytokines (IL-1b) using a targeted monoclonal antibody could reduce heart attacks without lowering LDL levels (7). An even earlier trial in 1989 in normal subjects demonstrated that high-dose omega-3 fatty acids (5 grams per day) significantly lowered the levels of a variety of pro-inflammatory cytokines (8). This is why the AA/EPA ratio in the blood is the best marker for determining the reduction of pro-inflammatory cytokine production. But reducing cytokine levels to lower inflammation is dramatically enhanced by the simultaneous increase in a group hormones known as resolvins. Omega-3 fatty acids can produce two groups of hormones. One are pro-inflammatory hormones known as eicosanoids and the other is a group of pro-resolution hormones known as resolvins. When it comes to eicosanoids, DHA cannot produce eicosanoids and the eicosanoids produced from EPA are weakly inflammatory. Since the eicosanoids generated from EPA are 10-100 times less inflammatory compared to those generated from AA the end result is that as EPA is increased at the expense of AA in the body. This means the intensity of the inflammatory response is significantly reduced (9). What might appear to be an “anti-inflammatory” effect, is actually a significant reduction of the intensity of overall inflammation. The real benefits of omega-3 fatty acids comes from their production of resolvins. This is why you need both EPA and DHA as each omega-3 fatty acid makes different types of resolvins that interact with different receptors. Furthermore, you need a much higher concentration of both EPA and DHA in the blood to generate the levels of resolvins that are necessary to resolve existing inflammation (10-12). Thus, the real benefits of high-dose omega-3 fatty acids may come from their ability to increase resolvin production as well as the reduction of pro-inflammatory cytokines. This would explain why the low-dose of omega-3 fatty acids used in the VITAL study generated essentially negative results. Unless you generate adequate levels of resolvins and simultaneously reduce cytokines by sufficiently lowering the AA/EPA ratio with high-dose omega-3 fatty acid supplementation, it is unlikely you will have significant clinical benefits. This was demonstrated in the subsequent analysis of the JELIS study when it was demonstrated that only when the AA/EPA ratio had been reduced to a level of less than 1.3 that statistically significant differences in cardiovascular events between the active and control groups become apparent (13). It was also demonstrated in an earlier study that the level of EPA (3.8 grams per day) used in the REDUCE-IT study would lower the AA/EPA ratio to 1.2 (14). Using a lower dose of 1.9 grams of EPA per day, the AA/EPA ratio was only reduced to 2.3. Based on the clinical results of the JELIS and REDUCE-IT studies, it appears that you have to reduce the AA/EPA to less than 1.3 using high-dose omega-3 fatty acid supplementation to see a therapeutic effect in treating cardiovascular disease by a combination of two factors of increasing resolvins as well as lowering cytokine levels. Since you need both EPA and DHA for optimal clinical benefits, I happen to believe a 2:1 ratio of EPA and DHA provides the greatest overall benefits to omega-3 fatty acid supplementation. The REDUCE-IT trial indicates you probably need 4 grams of EPA per day to get a cardiovascular benefit, but that means to get an optimal cardiovascular result you would want another 2 grams of DHA per day or a total of 6 grams of EPA and DHA per day. How Do You Know How Much EPA and DHA to Take? It is virtually impossible to measure either eicosanoids or resolvins in the blood and it is relatively difficult to measure cytokines, but you can easily measure the AA/EPA ratio. The published data from the JELIS and REDUCE-IT trials indicates that to have maximum cardiovascular benefits, the AA/EPA ratio should less than 1.3. This is why you should always test, not guess about your health. Furthermore, don’t believe statements that omega-3 fatty acids have no health benefits. They do, but only if you lower the AA/EPA ratio in the blood to an appropriate range, which requires higher amounts of omega-3 fatty acids to do so (15, 16). Calder PC. “Omega-3 fatty acids and inflammatory processes: from molecules to man.” Biochem Soc Trans. 2017 Oct 15;45(5):1105-1115.